He was in love! With the jewel of the jungle! He was totally spellbound by her enthralling beauty and the mesmerizing tunes of her song. It was truly a heavenly bliss standing still and gazing at the graceful form oscillating to and fro to the rhythm of the crickets' songs on the swing hanging from the large Banyan tree. Her hair glistened like newly formed pearls. Her gown seemed to radiate an aura that no material on earth could possibly produce. Her face shone like the moon. She sang softly and her tunes seemed to resonate with the sounds of the forest - the rustling of the dried leaves, the chirping of the evening birds, the chattering of the monkeys on the trees, the far cry of the lone wolf! The song seemed to have magically fused all these sounds into a single irresistible melody. He wished this moment would last forever. He wanted no food, no drink, no sleep. His father, his mother and even his fiancee, to who he had professed undying love, lay forgotten. The pursuit of his old dreams and ambitions seemed but meaningless toil. All the riches of the world would have been but dirt off the ground to him at this moment. His entire existence had just a single meaning - the beautiful creature on the swing in front of him. He had brushed aside the warning as mere village superstition. But one tended to start believing things one normally doesn't when stranded all alone in the middle of the jungle in the twilight hours. He however felt no fear; he felt only awe. If she was a ‘Mohini Pisasu’, he would gladly let her take the very last drop of blood that flowed through his veins if she were to just ask for it in her mellifluous voice. "Interesting", he had remarked, disinterestedly then. Now he wondered if the girl in front of him was the wolf girl. She definitely had the regal bearing of a princess. He had then laughed at the old man who had seemed like a priest or shaman of some sort and had told him to go and get a mental checkup done. The old man’s words did not seem so ludicrous any longer. He wanted to prostrate before this celestial beauty and offer her his worship. 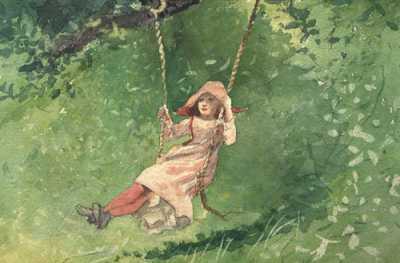 Slowly as the sun faded, the girl’s song seemed to wane and the swing started swinging slower and slower till it finally came to a stop. The girl descended gracefully from the swing and began to walk towards the thicket of trees. “No! Please don’t leave me and go.” A strong protest rose in his mind. Suddenly his reverie was broken by the sound of a dual volley of shells being fired. He could feel the recoil of the Marlin M444. Hadn’t he come with the purpose of getting his miners rid of the menace that stalked them? She was dangerous. As long as she was alive, the mining operations could not go on. It was his duty to ensure the safety of the miners. She had to be killed. There was no room for sentiments. The shells had strayed wide off their marks. His shots had been half-hearted. He never really had the intent to kill her. They were more his way of protesting against her leaving. Though the girl was unscathed, a pall of silence had descended over the entire jungle. She stopped in her tracks,turned around and looked at him briefly for half a minute and then melted away into the night. But that look was something that would remain with him all his life. That hurt look that told him she was deeply disappointed with him. That he had somehow violated her trust. He would regret this day all his life. What an enticing story !